I’m so glad to share with you a message about mastering the Art of Being Unordinary. You see, what I’ve discovered is that we nod our heads in agreement believing that we understand the forgiveness of God, that we’ve got a good handle on it, and yet deep inside many of us struggle with its most basic principles. Just a month ago in Nashville, Tennessee, 38-year-old Brian Redden stopped at a convenience store to get some gas when another car pulled up alongside of him. The passenger door opened and a young man climbed out, pointed a gun at Brian demanding, “Give me your wallet… give me your keys… I’m taking your car.” Unfortunately, he didn’t respond fast enough and the teenager shot him before taking his car. Now, Brian is expected to make a full recovery, but what’s really amazing about this story is his response to this young man who was arrested several days later. In a public statement, he said, "I have no anger for what happened. I pray he finds his way." And he forgave this 16-year-old young man, recognizing that his assailant was the one who needed help and not himself. In fact, Brian said, "I've got friends, family, and my faith to carry me on." Time and time again we hear amazing stories of people who’ve endured great suffering at the hand of another and yet were willing to move past the offense and extend forgiveness to the perpetrator. We saw it in the way that the Amish families in West Nickel Mines, Pennsylvania extended forgiveness to Charles Roberts in 2006 after he killed five schoolchildren that he’d taken hostage. We saw it in the way that Robbie Parker stood in front of the cameras publicly forgiving the gunman who killed his daughter in the Sandy Hook shooting. And yet, maybe today you wonder, “Would I be able to do the same?” In fact, some of you may have already decided that you can’t, you wouldn’t forgive such an offense, and I understand because it’s hard to even imagine being able to forgive to such an extent. Yet, the real challenge for us isn’t limited to such big offenses, it’s being able to forgive those little things that others do to us day in and day out. You know, for some of you, maybe it’s a brother who bullied you throughout your entire childhood, or parents who always seemed to put you down, or a spouse who always does this or that. But the reality is that when we allow these offenses to pile up, they become a mountain of pain, bitterness, and resentment that not only threatens our own well-being, but the very core of our relationship with God. You see, unforgiveness not only wreaks havoc in your personal life, but it spreads like cancer throughout your home, your workplace, your community, and even your church. When we refuse to forgive, unforgiveness destroys every meaningful relationship in our lives. “As it is, you do not belong to the world, but I have chosen you out of the world” (John 15:19). 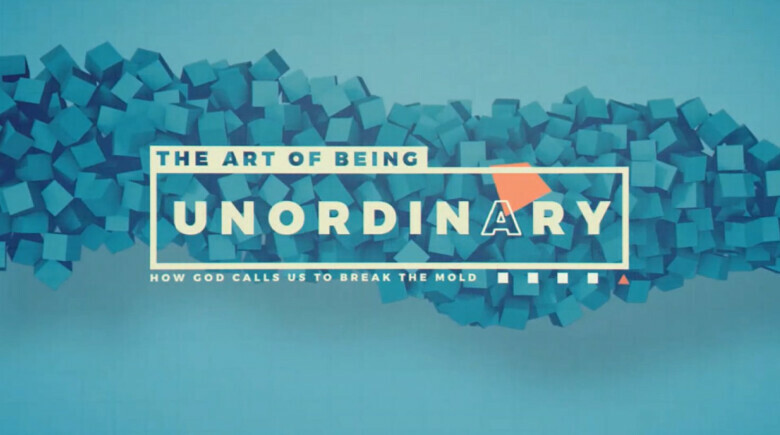 He calls us to be extraordinary, to break the mold, to be in the world, but not of the world, and so we must master The Art of Being Unordinary. You see, if there’s a message that the world needs to hear today, it’s the message of forgiveness. And so, we’re going to look at something that Jesus said, that just may make you feel a little uncomfortable, but because Jesus said it we must take it seriously. The Scripture comes from Matthew’s gospel, in chapter 6, and Jesus said beginning in verse 14. “If you forgive those who sin against you, your Heavenly Father will forgive you. But if you refuse to forgive others, your Father will not forgive your sins” (Matthew 6:14-15, NLT). Now, I still remember the sense of panic I felt when I heard that passage for the first time, because if you’re anything like me you’ve been hurt by somebody. Somebody, somewhere, has hurt you, and so, maybe there’s something that you’ve experienced, something that you’ve seen or heard, that is just unforgivable in your mind. And that’s what I want to talk to you about today, because we act as if forgiveness is something that’s available to us in an unlimited supply. But when it comes to others we want to ration it out in meager amounts as we see fit. However, Jesus made it very clear that if you want to be on the receiving end, if you want to experience God’s forgiveness, that you must be willing to forgive others. And so, how can you forgive when you’re carrying the burden of a significant offense? You know, when someone’s abused you, took advantage of you, lied to you, or cheated you. Or maybe it was someone that hurt someone else, someone you love, maybe your child, or your spouse, and they did something that devastated you, whatever it was, but you feel like it was completely unjustified and absolutely unforgivable. And so, what I want to share with you is three thoughts to help you break free from the pattern of this world and to start mastering The Art of Being Unordinary. The first thought is that Jesus taught an alternative to revenge. "You have heard that it was said, 'Love your neighbor and hate your enemy.' But I tell you: Love your enemies and pray for those who persecute you” (Matthew 5:43-44). Now, when Jesus said this it was shocking because his Jewish audience had always been taught an eye for an eye and a tooth for a tooth. That was normal, that was ordinary, and so when someone did them wrong, they just wronged them right back. If someone flipped them off, they’d flip them off right back, but Jesus gave them an alternative. He said be unordinary. He said, love your enemies, pray for those who persecute you. And so, if you’ve been insulted, offended, or hurt by someone, Jesus said that you’re to pray for them. What that doesn’t mean, is that we pray that they’d go to “H, E, double hockey sticks”, we don’t pray that they’d get hemorrhoids, but we pray that God would do something significant and bring blessings into their lives. That’s what Jesus was saying, it’s pretty straightforward, it’s not easy to do, but be unordinary and love your enemies. “Do not resist an evil person. If someone strikes you on the right cheek, turn to him the other also (Matthew 5:39). And so, you’ve been hurt, insulted, and shamed. Notice that Jesus specifically stated the right cheek, in other words, they just backhanded you across the cheek. So, you’re mad, you’re burning up inside, your blood pressure has gone through the roof, because when somebody backhands you across the face, it’s the ultimate form of disrespect. But guess what? Your life isn’t being threatened. Listen to what Jesus is not saying here. He’s not saying that in every circumstance you should be completely passive. He’s not saying that you should just let people walk all over you. And is not saying that you shouldn’t do anything to protect yourself or your loved ones. In fact, when Jesus entered the temple area, he “drove out all who were buying and selling there. He overturned the tables of the money changers and the benches of those selling doves” and he certainly wasn't being very passive there (Matthew 21:12). When Paul and Silas were released from prison in Acts chapter 16, after being beaten and imprisoned without a trial, Paul was far from being passive as he demanded his rights as a Roman citizen. In Matthew chapter 18 when Jesus encouraged believers to confront those who sinned in order to help lead them to repentance, he wasn’t encouraging us to be passive either. And so, Jesus teaching to “turn the other cheek” out of the context can be easily misinterpreted. But the principles remain the same and within the context we can understand the phrase “do not resist” to mean don’t retaliate. And so, Jesus isn’t telling us to be timid and passive; he’s telling us not to be spiteful, malicious, or hostile. He’s talking about taking revenge, not reacting in self-defense. Jesus is teaching us an alternative to revenge, showing how we can demonstrate our maturity by loving our enemies. “God showed his great love for us by sending Christ to die for us while we were still sinners” (Romans 5:8 NLT). Jesus teaches that when you're insulted, you can choose an alternative to revenge, you can be like your Heavenly Father and love your enemies. And when you do that, it may not change them, but it will most certainly change you. You’ll never be more like your Heavenly Father than when you love those who don’t love you, refusing to retaliate and instead offering them grace. Number two, Jesus teaches us that The Art of Being Unordinary is an attitude in action. And Jesus gives us the meaning to the story, he said, "This is how my heavenly Father will treat each of you unless you forgive your brother from your heart” (Matthew 18:32-35). You see, when we hold onto unforgiveness it’s we who are turned over to the torturers. The debt of unforgiveness is ours. And the bitterness of resentment poisons not only our relationships but our very soul. “Bear with each other and forgive whatever grievances you may have against one another. Forgive as the Lord forgave you” (Colossians 3:13). That's the model we're to live by, it’s attitude in action, we’re to forgive as the Lord forgave us. And the Lord never commands us to do anything that he doesn’t also give us the ability to do. And so, with the help of God, you can be empowered to do something that you couldn’t ever even imagine doing on your own. In fact, in our flesh we don’t have what it takes to forgive like that, but by the power of the Holy Spirit in us, we can learn to forgive just like we’ve been forgiven. But, in order to do this, we need to understand that forgiveness isn't a feeling. Resentment is a feeling. Unforgiveness is a feeling. But forgiveness is a conscious choice, it’s more of an attitude in action. And so, The Art of Being Unordinary requires not just an awareness of another person’s sin, but also an awareness of our own, and an understanding, number three, that there’s an abundance of God’s mercy. “Make sure that nobody pays back wrong for wrong, but always strive to do what is good for each other and for everyone else” (1 Thessalonians 5:15). If there is any message that we need to hear today, any example that we need to set for the world, it’s the example of forgiveness. If there’s any action that we need to take in moving in the direction of imitating Jesus and practicing The Art of Being Unordinary it’s the action of forgiveness. And so, if you apply the teaching of Jesus, if you’ll extend the attitude of forgiveness to others, you yourself will experience an abundance of God's mercy. This forgiveness that we’ve been given, this forgiveness that we extend to others, begins with a choice to forgive. It’s not an emotion or a feeling, but it’s a choice. I choose to forgive you because in Christ I’ve been forgiven. And so, we offer to others the same mercy and the same grace by which we’ve been forgiven. “Love your enemies and pray for those who persecute you, that you may be sons of your Father in heaven” (Matthew 5:44-45). "And when you stand praying, if you hold anything against anyone, forgive them, so that your Father in heaven may forgive you your sins" (Mark 11:25). "I—yes, I alone—will blot out your sins for my own sake and will never think of them again" (Isaiah 43:25). That's how good our God is and I’m so grateful to know the abundance of his mercy. Therefore, one of the greatest gifts that we can give to one another is to leave the past in the past. Because when you forgive someone, when you let it go, you make the choice to forgive as you’ve been forgiven and you set God’s mercy in motion. Jesus calls us to extend that same mercy to one another and yet we know that we can only do so by his grace. Day in and day out we’re challenged to forgive the offenses of others, offenses which left alone have the power to spread poison to all around us, to drain us emotionally and to destroy us spiritually. But as we practice The Art of Being Unordinary, praying for those who persecute us, loving our enemies, forgiving as we have been forgiven, our good God forgives us freely. Graphics, notes, and commentary from LifeChurch, Ministry Pass, PC Study Bible, Preaching Library, and Sermon Central. Scripture from the New International Version unless otherwise noted.